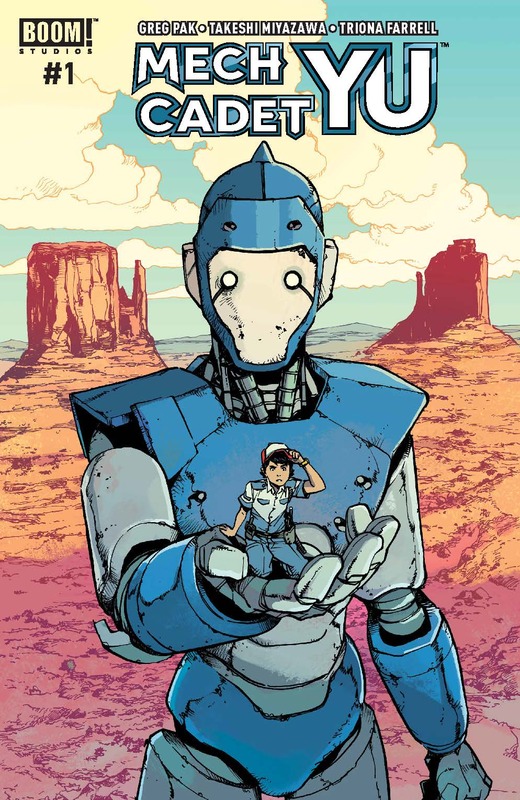 Greg Pak and Takeshi Miyazawa’s hit new comic series Mech Cadet Yu has been upgraded from a miniseries to an ongoing. One of the newest titles from BOOM! Studios, Mech Cadet Yu tells the story of a young janitor who accidentally bonds with a giant robot and has to join an elite class of cadets being trained to save the world. The first issue, which we reviewed for the Comics Corner, sold out at the distributor level during its week. Such a positive reaction for an original series spurred BOOM! to upgrade the title from a limited series to an ongoing book. Now, instead of wrapping up after the first four issues, Mech Cadet Yu will continue on past the originally planned story into new territory. Check with your local comic shop to see if there are any more copies of #1 available, and while you are there be sure to preorder #2 before August 21st to ensure you get a copy when it hits stands on September 13th.